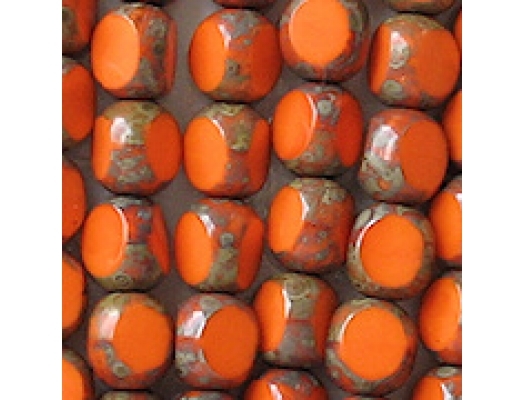 Colors/description: Opaque bright orange with a mottled grayish-brown "picasso" coating on the round portions. 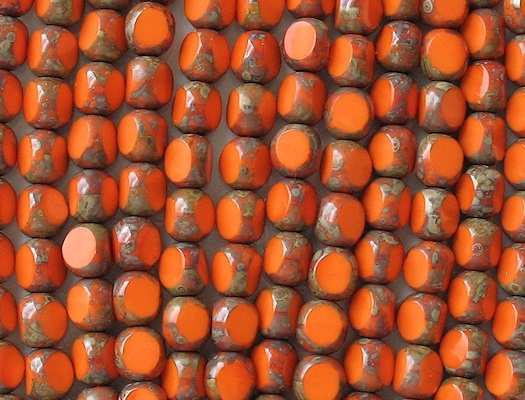 Defects: Some slight imperfections can be seen in the facets (specifically, shallow ridges can be seen on some facets), but that is normal for Czech faceted beads. I also noticed an occasional nick or small pit. Comments: These beads are every bit as bright as the picture indicates. These 3-cut beads have deeper "cuts" than other 3-cut beads that I have carried in the past, so they appear triangular when looked at from above. 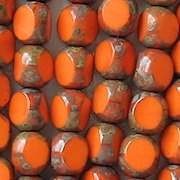 These beads are from a new supplier that has higher prices than the suppliers I was using before, so my price is pretty high. However, I feel that the quality is better. Despite what I say under "Defects" above, I feel that these beads are a cut above the other 3-cut beads that I have carried before.